Senator Rand Paul on Monday called for top Obama aide Susan Rice to testify under oath before congress in response to new reports showing she ordered the "unmasking" of Trump transition officials who were spied on by the government under Obama. Eli Lake reported yesterday that Rice "requested the identities of U.S. persons in raw intelligence reports on dozens of occasions that connect to the Donald Trump transition and campaign." In plain language, she spied on Trump's associates throughout the election, and it had nothing to do with tenuous connections to Russia. “I don’t think we should discount how big a deal it was that Susan Rice was looking at these, and she needs to be asked, did President Obama ask her to do this? Was this a directive from President Obama?” Paul told reporters. “I think they were illegally basically using an espionage tool to eavesdrop or wiretap — if you want to use the word generally — on the Trump campaign,” Paul said. Smoking gun found! Obama pal and noted dissembler Susan Rice said to have been spying on Trump campaign. 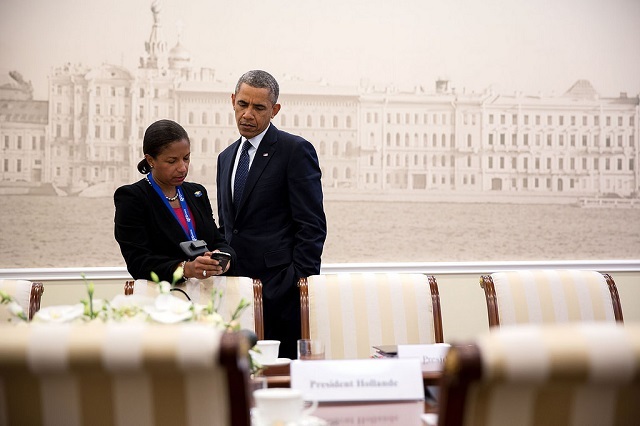 “Is there a possibility that Susan Rice was politically motivated? Let’s ask her why she was opening up all of the conversations with Trump transition figures,” he said. This is the real scandal the Democrats are trying to hide with this made up Russian conspiracy hoax. You know this cuts deep because the big three networks are almost completely ignoring it when they'd be going batsh*t crazy if it came out the Bush administration did this to Obama. Barack Obama needs to be made to testify. Same goes for Susan Rice, James Clapper and John Brennan. We need to know what they knew and when they knew it.